Welcome to my NFL Draft Page! I am a big fan of the NFL Draft and I've like sharing my opinions and information with other big fans of the NFL Draft. On this page you will be able to find Prospect Rankings, Player profiles, Draft order, Team Needs, Mock Drafts and my own Mock. I also will give links to other helpful and informative Draft sites. I am a Big Fan of the Chicago Bears and I have much info on them and Ideas for them including what they should do, who they should Sign, Release, Trade Or Draft. 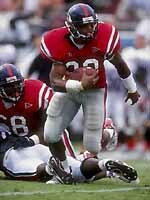 Deuce MaCallister Running Back, Mississippi Is the top Running back Prospect for the 2001 NFL Draft. Deuce is a complete runner with the speed to run to the outside and the power to punish you up the middle. Drew Brees Quarterback, Purdue is the Top Senior Quarter back prospect in the 2001 NFL Draft. Brees is a smart accurate Quarterback with the tools to be a good pocket passer. In contention for the Heisman Trophy. 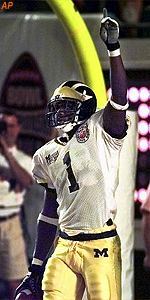 David Terrell Wide Receiver, Michigan Is the Top Wide Receiver for the NFL in 2001. Terrell is great at catching anything. If you throw him the ball he will catch it. An all-round receiver with a combonation of great size and speed.